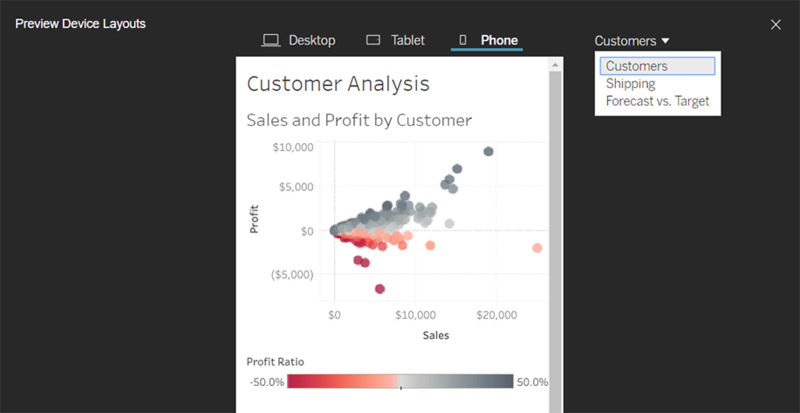 In Tableau Desktop, open the workbook you want to publish. Select Server > Publish Workbook. 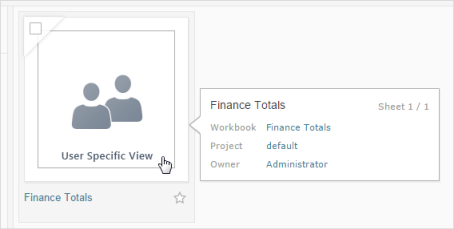 If the Publish Workbook option does not appear on the Server menu, make sure a worksheet or dashboard tab is active (not the Data Source tab). If necessary, sign in to a server. For Tableau Online, enter https://online.tableau.com. For more information, see Sign in to Tableau Server or Online. In the Publish Workbook dialog box, select the project, enter a name for the workbook, and add search tags. Tags help users find related workbooks when they browse the server. Separate tags using a comma or space. To add a tag that contains a space, put the tag in quotation marks. Generally, a site administrator manages permissions on the server. If you think your workbook is an exception, work with your administrator to determine the best course of action, and see Set Permissions as You Publish a Data Source or Workbook. For Data Sources, select Edit if you want to change whether the data is embedded in the workbook or published separately, or change how people authenticate with data sources. If you’re publishing an extract and want to set up a refresh schedule, you must select Embed password or Allow refresh access. If your workbook connects to a Tableau data source, we recommend embedding the password. If you instead choose to prompt users, they'll need additional permissions on the data source. For more information, see Set Credentials for Accessing Your Published Data. Configure Variable publishing options that are available for this workbook. (Optional) Set up a refresh schedule for each extract you published. The publishing workflow guides you through these steps. 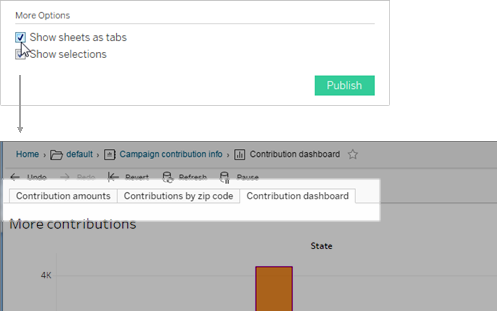 For some data types you publish to Tableau Online, the publishing process starts Tableau Bridge on your computer. For more information, see Schedule Extract Refreshes as You Publish a Workbook. The following options appear when they’re appropriate for the workbook. By default, Tableau Desktop publishes all sheets in a multiple-sheet workbook. In the Sheets section of the Publish Workbook dialog box, you can specify which sheets to include. Hiding sheets is useful when you want to publish a dashboard or story without showing the worksheets that were used to create it. Important: Hiding sheets is not a security measure. Anyone who has the Download/Web Save As capability can access the hidden sheets. Other editing permissions can also allow access to hidden sheets. For more information, see Content Access and Ownership in Tableau Server Help. If you select multiple sheets to show, you can specify how users navigate them. Select the Show Sheets as Tabs check box to provide tab-based navigation. Clear the check box to allow people to open only one view at a time. Select this to highlight a particular portion of the view when others open the workbook. Make your selections in Tableau Desktop before you start the publishing process. If your views contain information that isn't available to the server or other users, select Include External Files when you publish. With this option, you can include an Excel, CSV, or other data source file local to your computer, image files, and so on. If you're publishing to Tableau Server, and the workbook references data sources or images on a mapped drive, you can include external files when you publish, or you can change the connection information so that the workbook references the UNC path to the data source. For example, you could change D:\datasource.xls to \\filesrv\datasource.xls. If you're publishing to Tableau Online and the workbook connects to a data source that Tableau Online cannot connect to directly, such as one on your local network, you should also select Include External Files. To see how your designs appear on mobile devices, click Preview device layouts in the browser when publishing is complete. Then choose a device type above the viz, and a specific dashboard from the menu at right. If you don't like a device preview, open the workbook in Tableau Desktop, adjust device layouts, and republish. On the server, users can browse Tableau content with a thumbnail view. These thumbnail images are based on workbook sheets. If your workbook contains user filters, you can specify which user’s filter to use when creating the thumbnails. For example, if you want the thumbnail image to show all regions of a sales forecast, you can generate thumbnails based on a user who is allowed to see all regions. In the following scenarios, a generic image appears in place of the view thumbnail. The user you select does not have permission to see the data. The data is from a Tableau Server data source that utilizes data source filters, user calculations, impersonation, or other user references. To learn more about user filters, see Restrict Access at the Data Row Level.